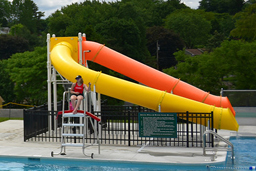 Description: Double 24" O.D. 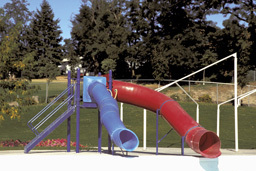 flume slide, one with a 90° elbow. 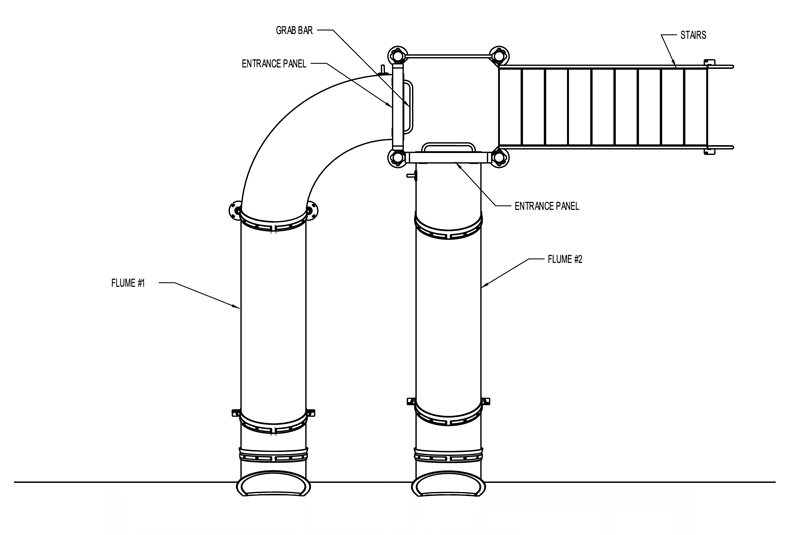 Centerline Run: 12' 8" & 16' 3"
Space Requirements: 13' 5" x 14’ 2”– Space requirements may vary with options chosen. 14-20 gpm water flow (each flume) recommended; 8 to 40 gpm required. 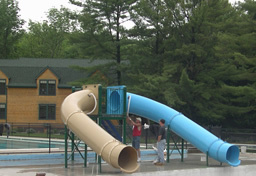 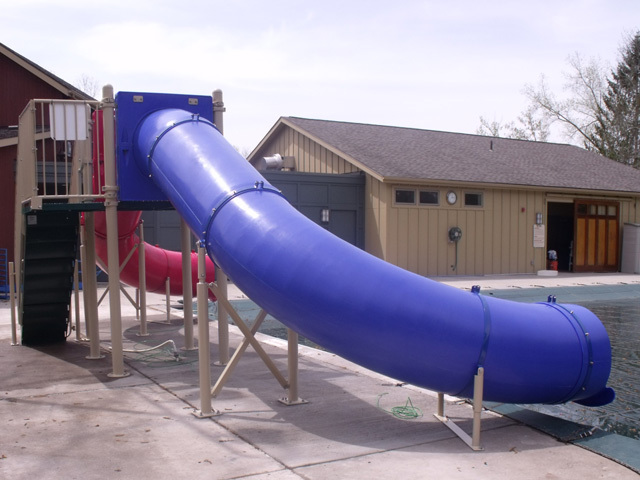 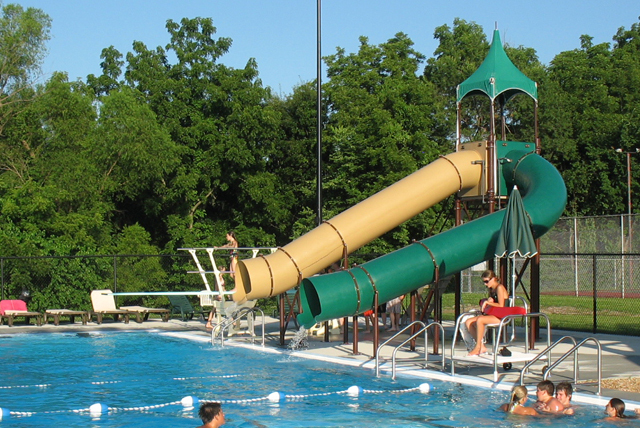 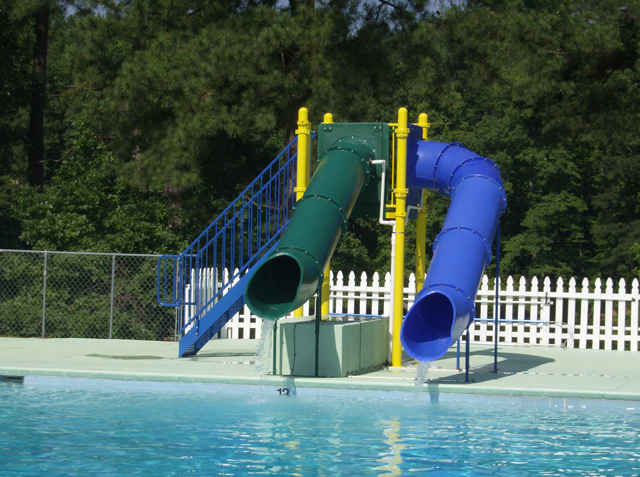 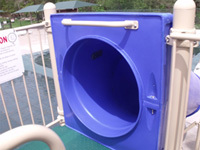 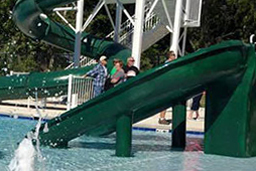 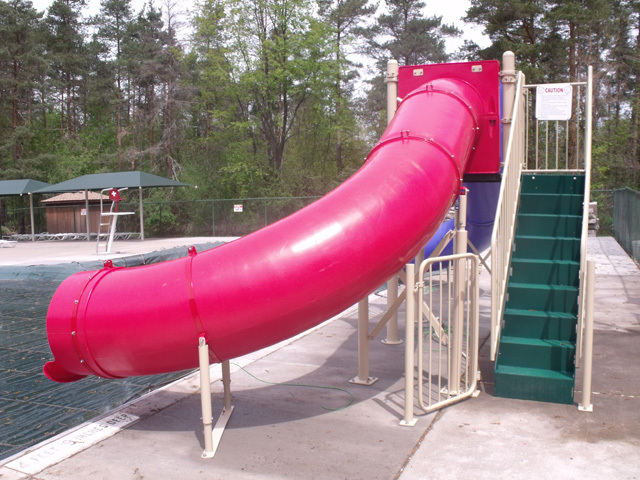 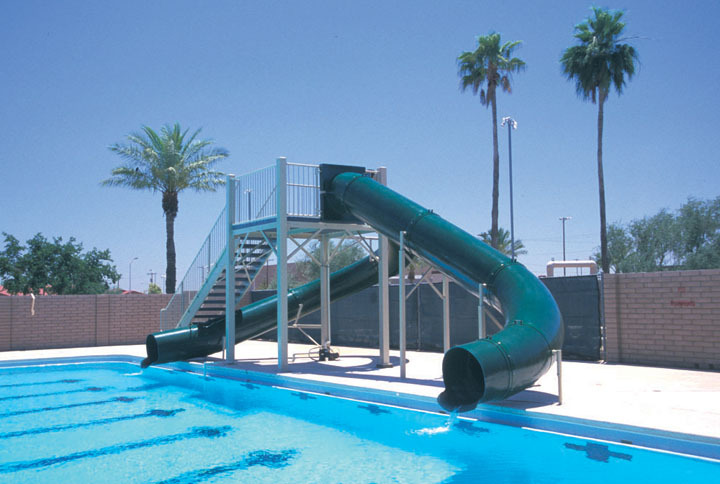 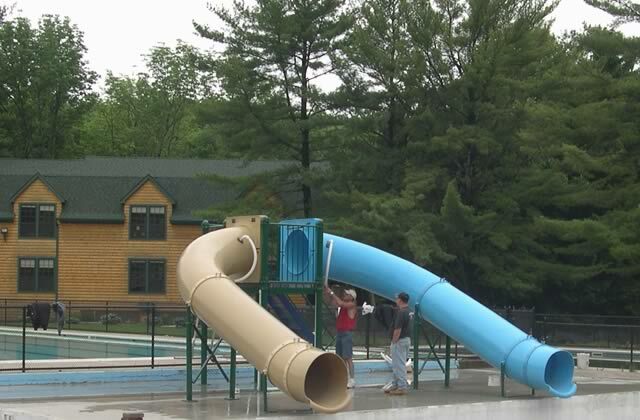 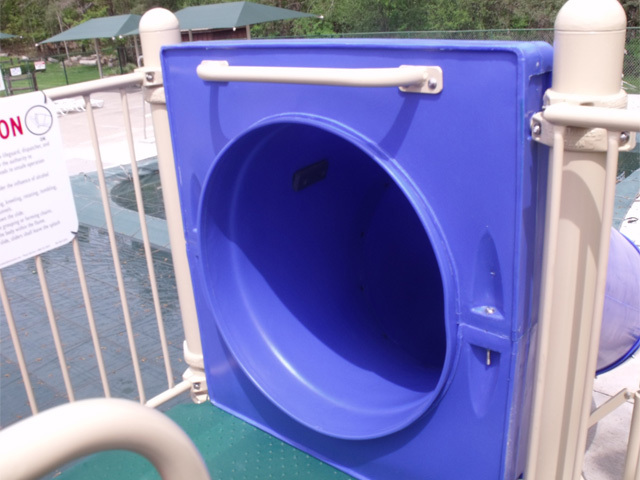 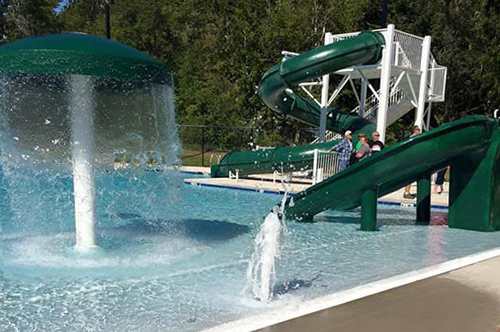 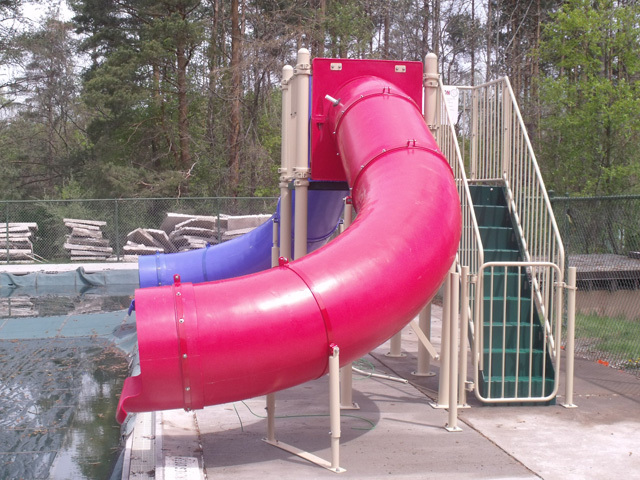 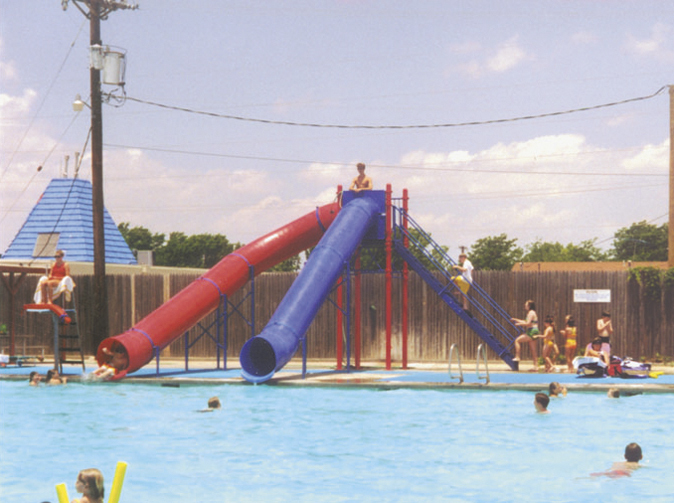 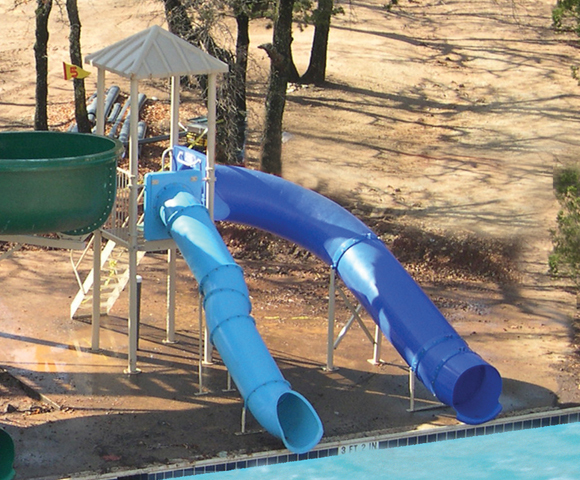 Splash down dimension: 17' 2" x 20' 0"
Description: Double flume slide, one 30" I.D. flume and one 24" O.D. flume. 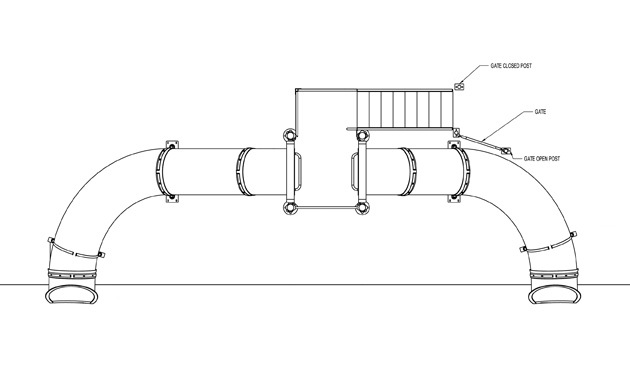 Centerline Run: 21' 0" & 16' 7"
Space Requirements: 17' 0" x 17' 2" – Space requirements may vary with options chosen. 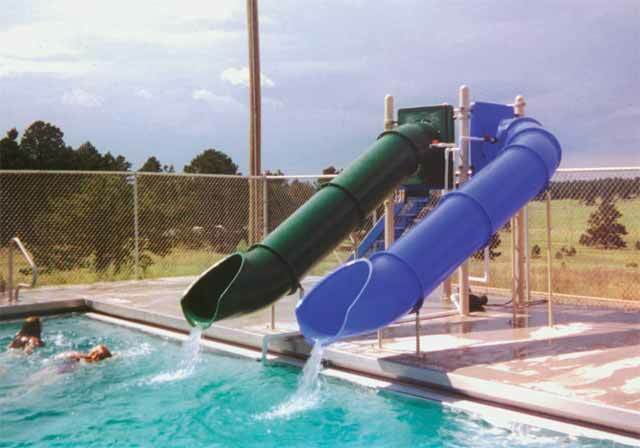 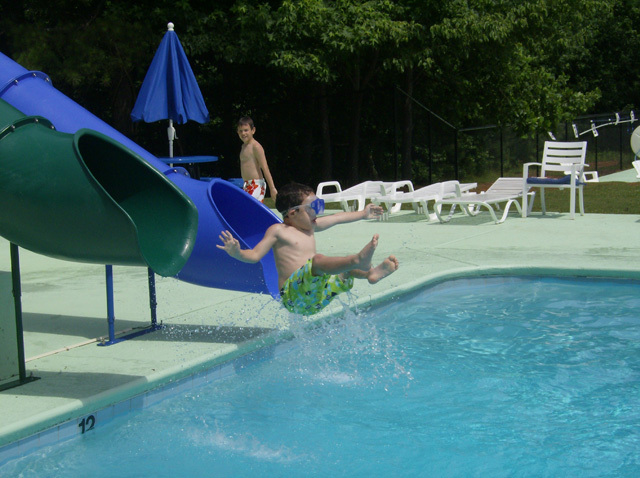 Splash down dimension: 22' 4" x 20" 0"
Description : Double fiberglass flume slide. 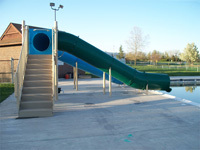 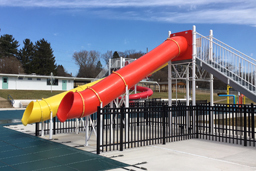 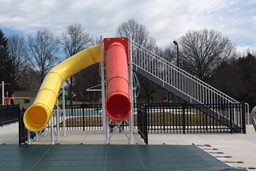 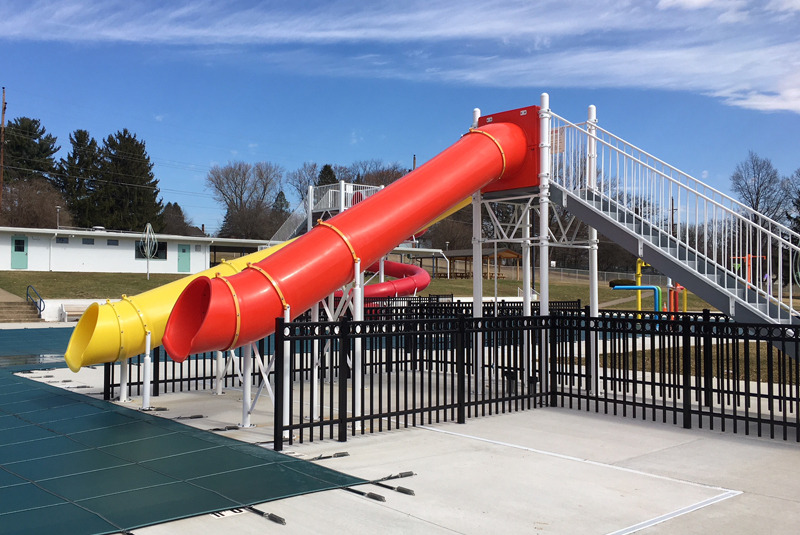 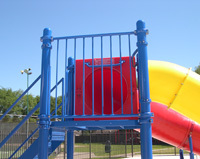 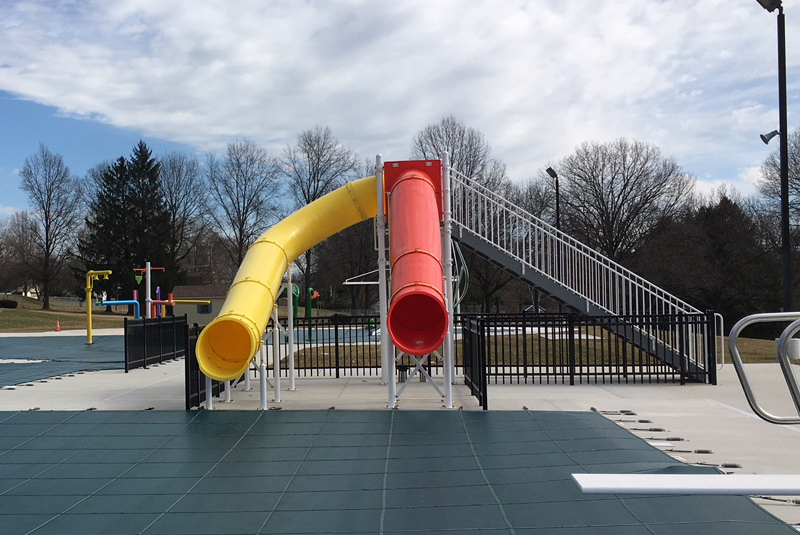 Slide Runs : 12' 0" & 12' 6"
Description: 30" I.D. 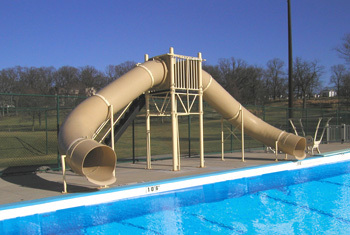 double flume drop slide. 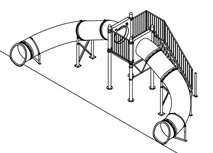 Centerline Runs: 20' 0"& 18' 10"
Exit Heights (drop): 3’ 0", 2' 0"
Space Requirements: Vary with options chosen. 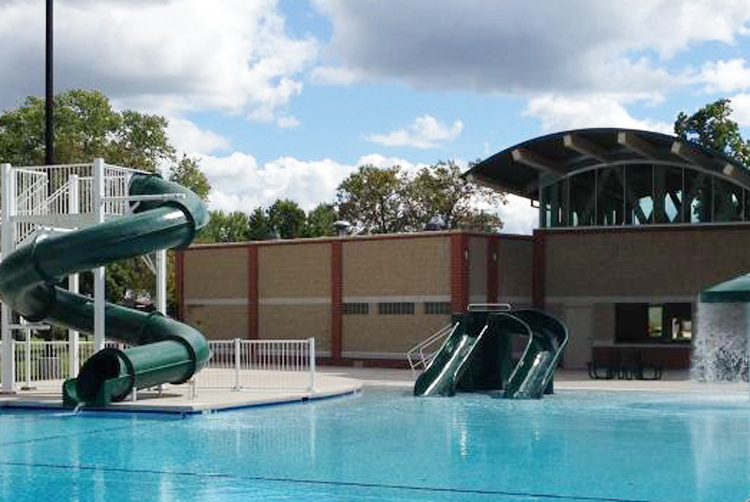 Tan & Green flumes: 23' 0" x 22' 1"
Stairs: 8" rise, 8" tread, 24" wide; Aqua-Plast coated textured aluminum surface. 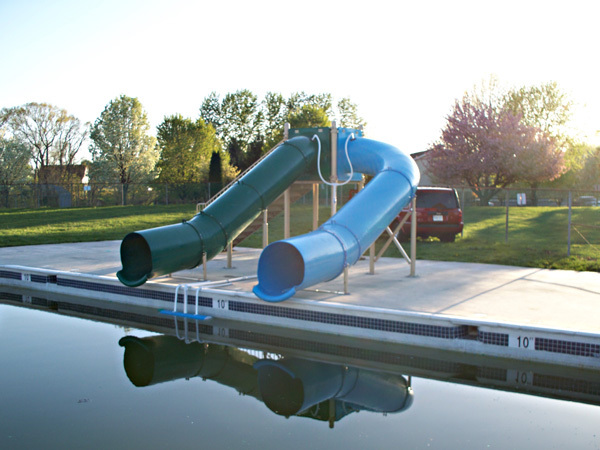 Minimum water depth: 9' 0"
Description: Double 30" I.D. 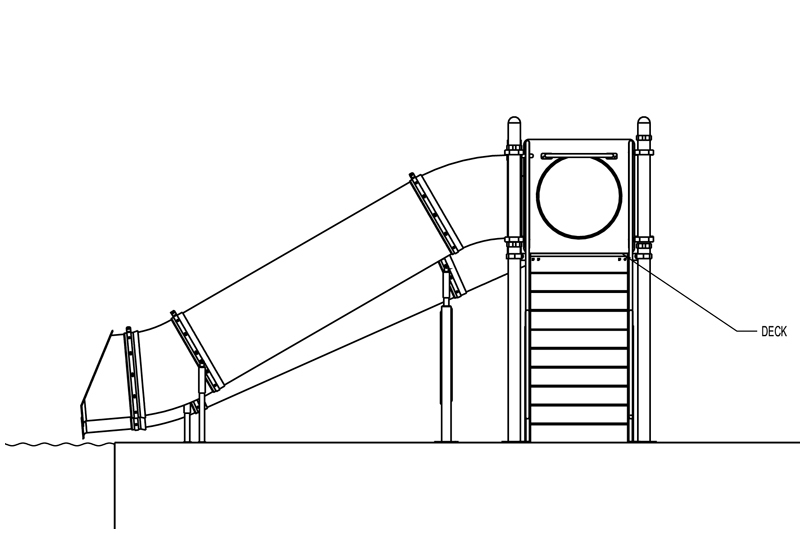 flume slide, each with a 90° curve. 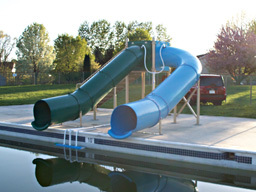 Deck Space Requirement: 19' 0" x 19' 5" – Space requirements may vary with options chosen. 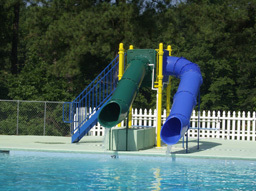 Description: Double 30" I.D. 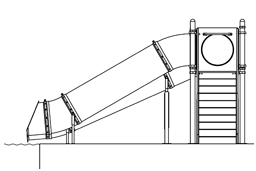 flume slide, one 90° curve, one straight. 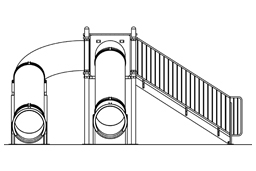 Centerline Run: 29' 6" and 22' 11"
Deck Space Requirement: 22' 3" x 26' 2" – Space requirements may vary with options chosen. 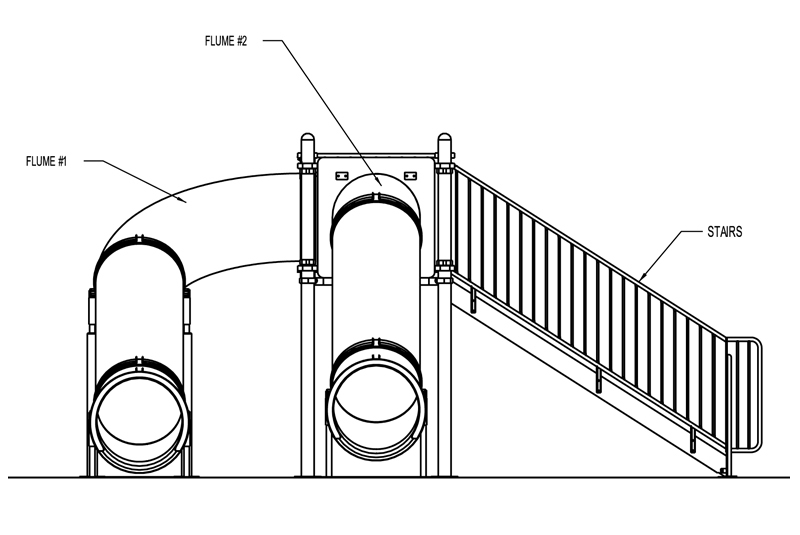 Centerline Run: 23' 9" and 17' 11"
Deck Space Requirement: 19' 0" x 20' 10" – Space requirements may vary with options chosen. Centerline Run: 19' 8" and 14' 5"
Deck Space Requirement: 20' 0" x 17' 3" – Space requirements may vary with options chosen. Splash down dimension: 19' 5" x 20' 0"
Description: Double 30" I.D. 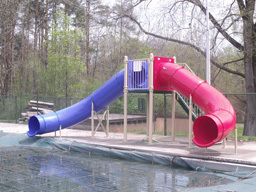 flume slide with 90° curves. 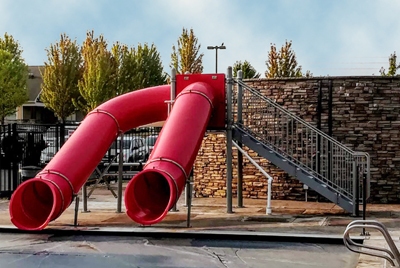 Centerline Run: 17' 6" and 15' 10"
Space Requirements: 29' 10" x 11' 2" – Space requirements may vary with options chosen. 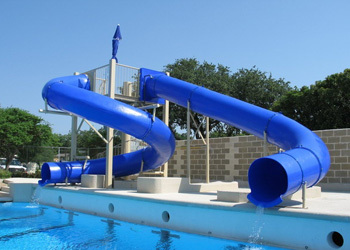 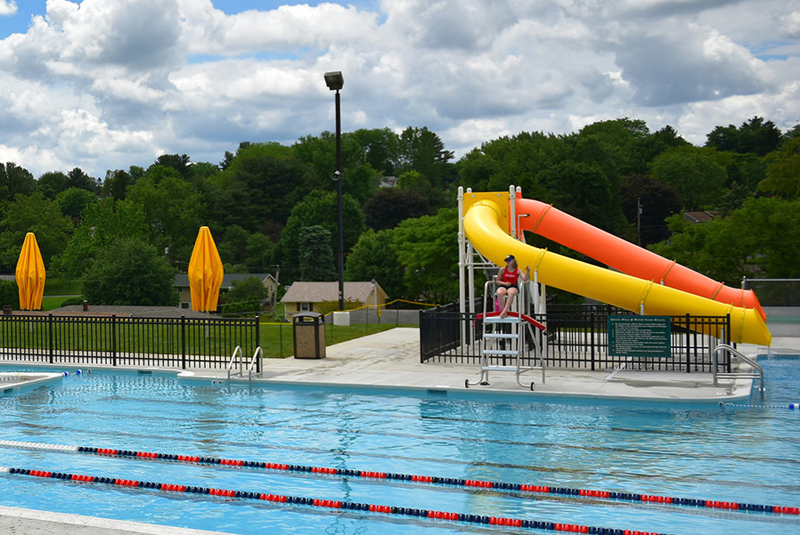 Splash down dimension: 39' 6" x 20' 0"
Space Requirements: 31' 10" x 12' 2" – Space requirements may vary with options chosen. 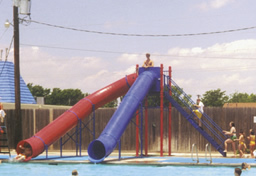 Splash down dimension: 41' 10" x 20' 0"
Description: Double 30" I.D. 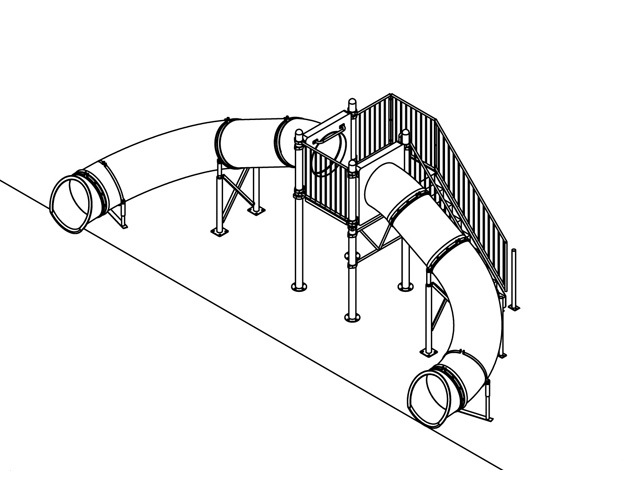 flume slide, (1) 90° curve; (1) 180° curve. 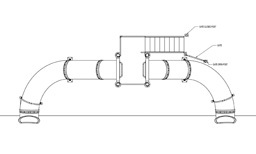 Centerline Run: 31' 6" and 32' 6"
Space Requirements: 45' 11" x 20' 0" – Space requirements may vary with options chosen. 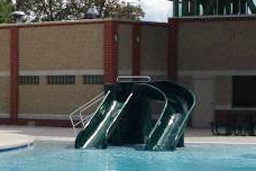 Splash down dimension: 47' 9" x 20' 0"
Description: Double 30” I.D. 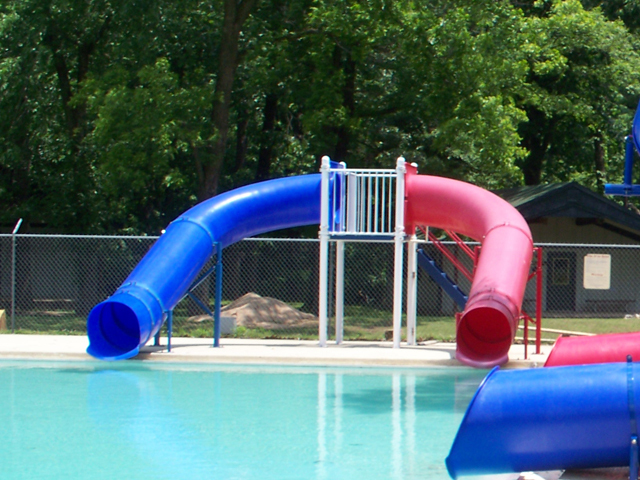 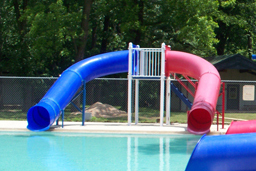 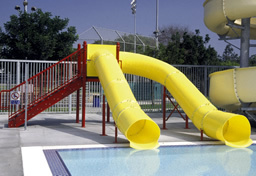 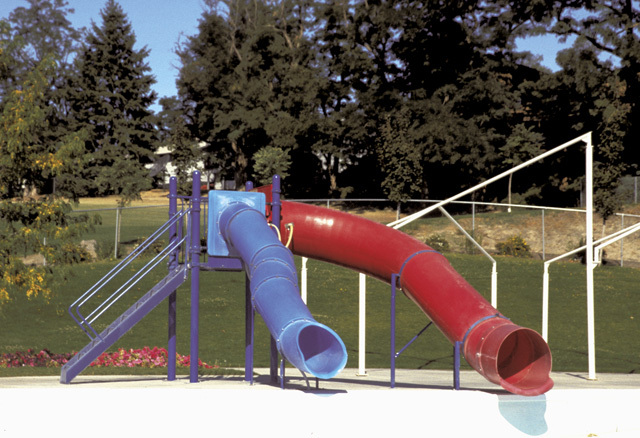 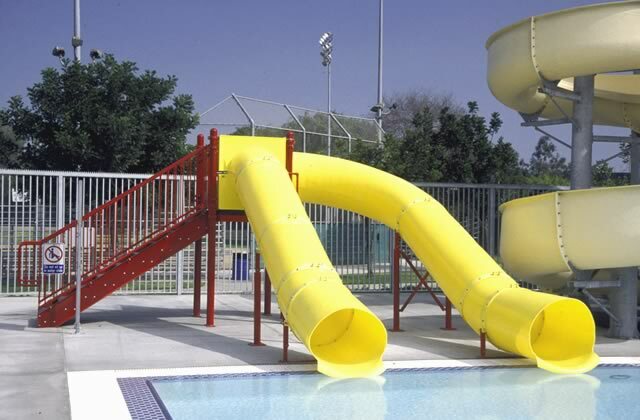 polyethylene water slide with one (1) 90° curve and one (1) 360° turn. 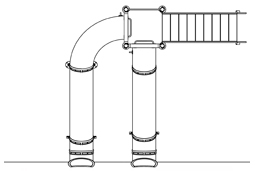 Centerline Run: 31' 6" and 43' 1"
Space Requirements: 33' 9" x 15' 2" – Space requirements may vary with options chosen. 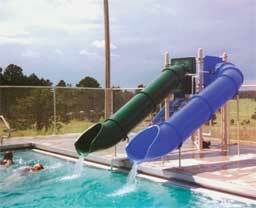 20 gpm water flow (each flume) recommended; 20 to 40 gpm required. 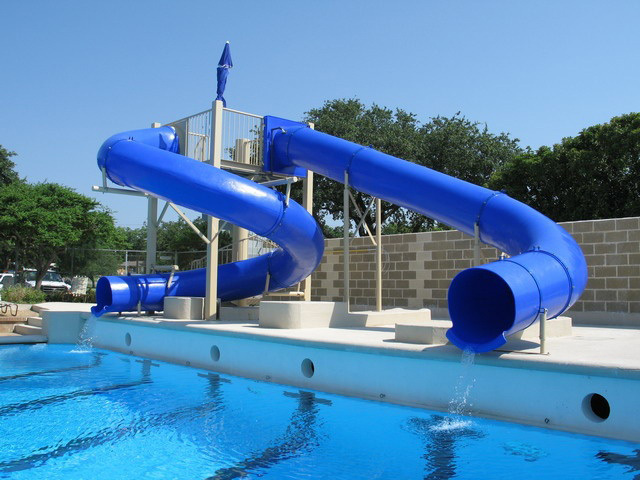 Add Excitement to your Pool!